At Nashoba Air & BoilerWorks, we know it isn’t enough to say we are proud of our excellent customer service … we know we need to prove it! It is true – we are proud of our customer service that begins the moment you call our office or get in touch through email or our website. From scheduling your in-home appointment to the reminder post card and courtesy reminder phone calls … to the booties on the shoes of our service and maintenance crew … and the follow-up call after the work is done, we want to be sure you are more than happy with our work. It’s not enough to make you satisfied – we are in the business of building relationships and we want to be your HVAC company of choice for life! After graduating from the Nashoba Technical High School in Westford in their Heating, Ventilation, Air Conditioning, and Refrigeration program, Shawn Kelley moved to Ocala, Florida to work as a Lennox Service Technician. It wasn’t long before Shawn missed his family and friends and the change of seasons in New England. So, within a year, he returned to Littleton. Shawn worked for Bursaw Gas & Oil in Acton and then became a salesperson and a manufacturer’s representative for Air Purchases in Burlington as a Trane Territory Manager for Northern MA and NH. He sold HVAC products and assisted with troubleshooting equipment, as well as training contractors on best business practices. After ten years and a record of having helped to launch many new Trane dealers, Shawn knew he wanted to become an entrepreneur and start his own HVAC contracting business. 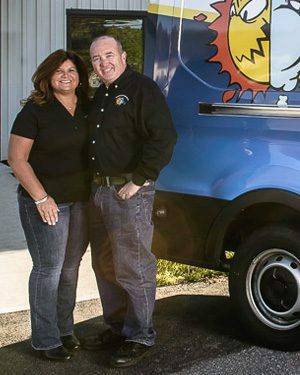 He discussed his dream with his wife Kerry and after sharing his business plan with her, they decided to open their HVAC installation and service company out of their home in Westford. It was 2002 and within just one year, the company’s growth had outgrown the tent in the backyard and they moved Nashoba Air to a 900 sq.ft. warehouse in Westford. By the fall of 2004, they added another 900 sq.ft. and by 2008 the company was employing nine installers, three service technicians, and two customer service representatives. That winter, they purchased a 7,000 sq.ft. office and warehouse in North Chelmsford and hired a full-time plumber. They re-named the company Nashoba Air & BoilerWorks and kept growing throughout the downturn in the industry during 2012 and beyond. In the fall of 2014, to better serve their geographic customer base, Kerry and Shawn decided to move to Littleton in their current location, an 18,000 sq.ft. building at 527 Great Road. Today, Nashoba Air & BoilerWorks employs more than 30 employees, offers a variety of services, and provides the most responsive, friendly customer service representatives you have ever talked to! We can help you select the right services and products for your home. Call today to request a free estimate.